Referred to as the grandfather of all swing dances, the Lindy Hop (or Lindy) is a couple's dance that originated in the early 1900s. Lindy Hop evolved from the Charleston dance and several other dance forms. Often described as the original Swing dance, the Lindy Hop relies mostly on improvisation by its dancers, making it both fun and playful on the dance floor. Lindy Hop Characteristics: The Lindy Hop is a sporty, athletic form of partner dancing. 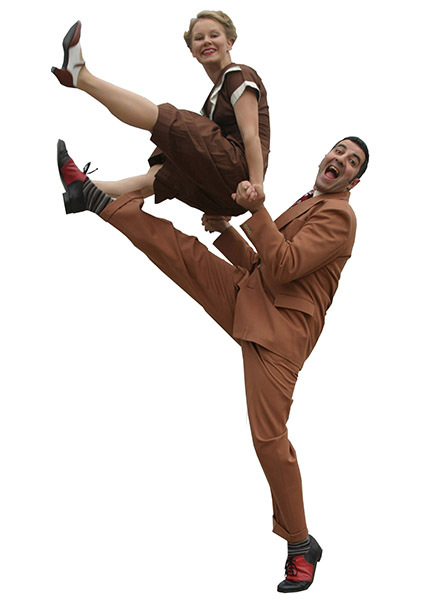 Instead of dancing in an upright, elegant posture, Lindy Hop dancers maintain an active, athletic stance that keeps their legs in constant movement. There are two main styles of Lindy Hop, Savoy style and G.I. style. Savoy style is characterized by long, horizontal lines, while G.I. style is danced in a more upright position. Although achieving the look of one of these styles is usually the goal, Lindy Hop dancers also bring their own personal style into the dance. This unique and energetic dance style can be wild and spontaneous, full of frenzied kicks and body movements, or very smooth, calm and sophisticated. Lindy Hop History: Lindy Hop developed as an African American dance, based in part on the popular Charleston dance. Named for Charles Lindberg's flight to Paris in 1927, the Lindy Hop evolved in the streets of Harlem. Despite its name, the dance has no "hop" to it. Instead, it is smooth and solid without hopping, bopping, or prancing by the dancers. The Lindy Hop has inspired several other dances such as East Coast Swing, Balboa, Shag, and Boogie Woogie. Lindy Hop Action: The defining movement of the Lindy Hop is the swingout. In the swingout, one partner pulls the other from an open position into a closed position while pivoting 180 degrees, and then swings the partner back out to the original starting position. Although the Lindy Hop can contain acrobatic moves, most steps are extremely smooth, precise and perfectly in sync with the music. Lindy Hop Distinctive Steps: Lindy Hop dancers make use of lots of fancy footwork borrowed from the Charleston and Tap dancing. Lindy Hop followers match the footwork of the leaders, and every step taken is a weight change. The Lindy Hop consists of both 6 and 8-count steps. Dancers often perform "shine steps" that allow the dancers to "shine" on the dance floor, including fun steps such as Suzi Q's, Truckin's, and Twists, as well as "air steps" in which dancers perform aerial moves include daring backflips. Lindy Hop Rhythm and Music: The Lindy Hop is a fast-paced, joyful dance with a flowing style that reflects its music. The Lindy Hop grew up with great Swing bands of the era: the bands inspired the dancers and the dancers inspired the bands, resulting in advances in both dance and musical expression that would eventually evolve into Rock 'n Roll. Whether referred to as Lindy Hop, Jitterbug, or Jive, the inspiring music was Swing, with a tempo of 120-180 beats per minute. Swing rhythms exist throughout rock, country, jazz and blues, making all of these music styles perfectly acceptable for dancing the Lindy Hop. Get 2 private lindy hop dance lessons for only $10! Singles or couples welcome. © 2015 All That Dance Studios in Louisville. Offering lindy hop dance lessons Louisville KY. Try 2 private lindy hop dance classes for only $10 and learn lindy hop dancing in Louisville.